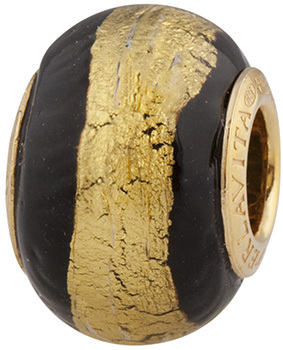 PERLAVITA Large hole bead with Vermeil, Gold Plated Sterling insert. This is our Stripes line with a base of red and a broad sash of 24kt gold fcompletely encased in authentic Murano glass. Great shape approxmately 14x12mm. The hole inside these is approximately 4.7mm which will fits popular bracelet systems.